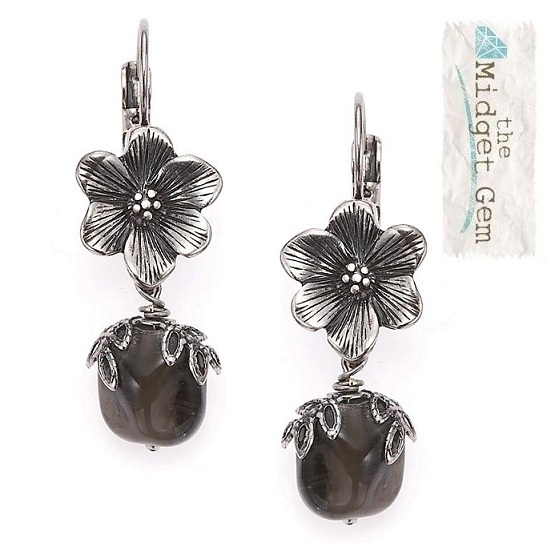 The 'Autumn Leaves' series gathers together a pretty selection of finely detailed leaves and floral motifs to produce a varied set of items which is great for the ‘mix n match’ approach to selecting and wearing your jewellery. Bohm have used finely detailed flowers, leaves and ornate bead caps, sparkly Swarovski crystal elements, mother-of-pearl shell, silver leaf encased glass beads, faceted glass and crystal beads to decorate this pretty series. 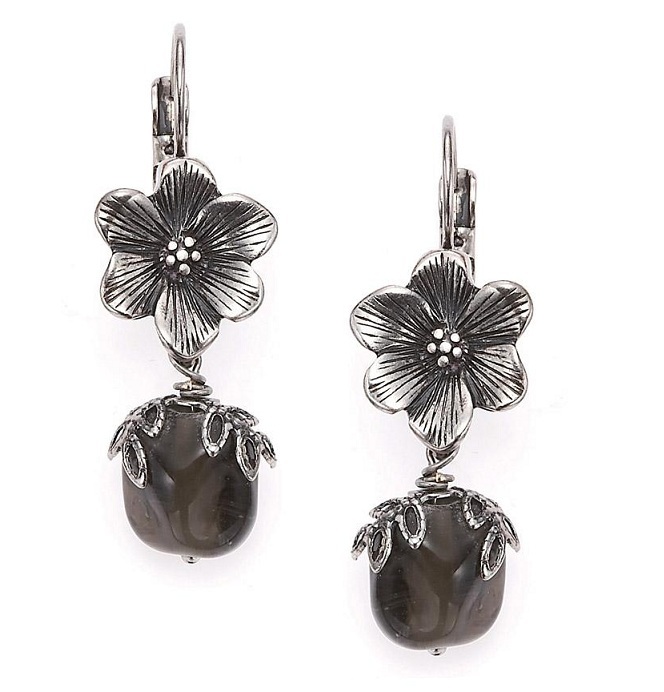 The Bohm 'Autumn Leaves' flower and glass drop earrings. Oxidized rhodium plate and black glass. The flowers measure 1.3cm/13mm. Total length 4.5cm/45mm in length. French clip fastener for pierced ears. The Bohm 'Autumn Leaves' glass bead and charm necklace. Oxidized rhodium plate and black beads. The beads/charms measure 8mm up to 2.5cm/25mm. Elongated chain links approx. 3mm wide, with fine leather cord interwoven throughout. Adjustable length 41cm/16 inches to 48cm/19 inches (extension chain with clasp). The Bohm 'Autumn Leaves' glass bead and charm cluster longer length necklace. Oxidized rhodium plate and black beads. The beads/charms measure 1cm/10mm up to 4.5cm/45mm. 'Elongated' rectangular links approx. 3mm wide, with fine leather cord interwoven throughout. Adjustable length 61cm/24 inches to 69cm/27 inches (extension chain with clasp). The Bohm 'Autumn Leaves' double-strand glass bead and charm necklace. Oxidized rhodium plate and black beads. The beads/charms measure 8mm up to 2.5cm/25mm. Double chain. Length of front drop 9cm/90mm. Adjustable length 41cm/16 inches to 48cm/19 inches (extension chain with clasp). 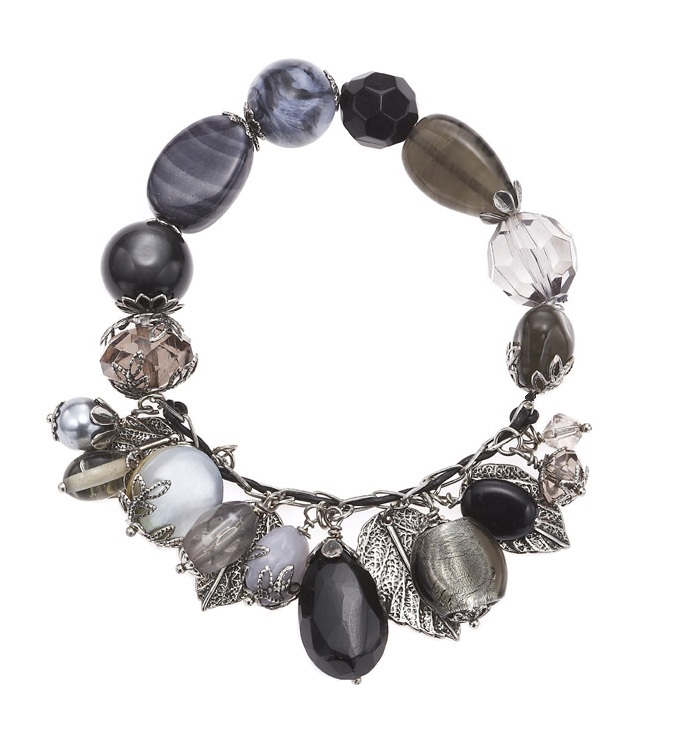 The Bohm 'Autumn Leaves' glass bead and charm stretch bracelet. Oxidized rhodium plate and black beads. The beads/charms measure 8mm up to 2.5cm/25mm. Charm section consists of elongated link chain approx. 3mm wide, with fine leather cord interwoven throughout. The remaining section is beaded elastic which gently stretches to fit most wrists comfortably. Unstretched it measures 18cm/7 inches.